In December, I authored an infographic report on racial disparities in Cleveland, which served to stoke community dialogue and keep the issue of systemic racism top-of-mind for many in the nonprofit and public sector communities. In the first part of 2019, I will explore some possible solutions to problems that were raised in the infographics. This blog is the first installment. It is important to note that what undergirded the content in the infographics was the idea that these issues―racial disparities wherein black residents face worse outcomes than white residents in nearly every area of life―are systemic at their core. Individual interventions via policy or programs will not end disparities, because pervasive racism will continue to take its toll. However, I suggest that our community, along with other cities around the country that are wrestling with this issue, needs to take a both/and approach. We need to work together against racism in all of our systems―big and small―while implementing solutions that work for all of our residents. First, some good news: preliminary 2018 data shows that in Cuyahoga County the disparity between black and white infant deaths went down significantly compared to earlier years. This is not the case throughout the state however, as the overall infant mortality rate for black babies actually increased in 2018. And in Cuyahoga County, black babies were still 3.5 times more likely to die than white babies. Preliminary 2018 data shows that in Cuyahoga County the disparity between black and white infant deaths went down significantly compared to earlier years. 2018 data is preliminary, and does not include data for December, 2018. So, what are we as a community doing to address this issue and eliminate these racial disparities entirely? And what more can we do? Birthing Beautiful Communities is one local organization that has dedicated itself to ending black infant deaths through a holistic approach. The essence of their program is training community-based doulas and “employing them to support pregnant women in their own neighborhoods.” This approach provides living-wage employment for women in the communities they serve, while also providing culturally appropriate, comprehensive prenatal and postnatal services for women who are at high risk of poor birth outcomes. …if equity were available, these disparate birth outcomes in the African-American community would not be happening. First Year Cleveland “mobilizes the community through partnerships and a unified strategy to reduce infant deaths and racial disparities.” Its goal is to reduce Cuyahoga County’s infant mortality rate from 10.5 per 1,000 live births in 2015 to 6.0 per 1,000 live births by 2020, and First Year Cleveland recognizes that this won’t be possible without an explicit focus on reducing black infant deaths. 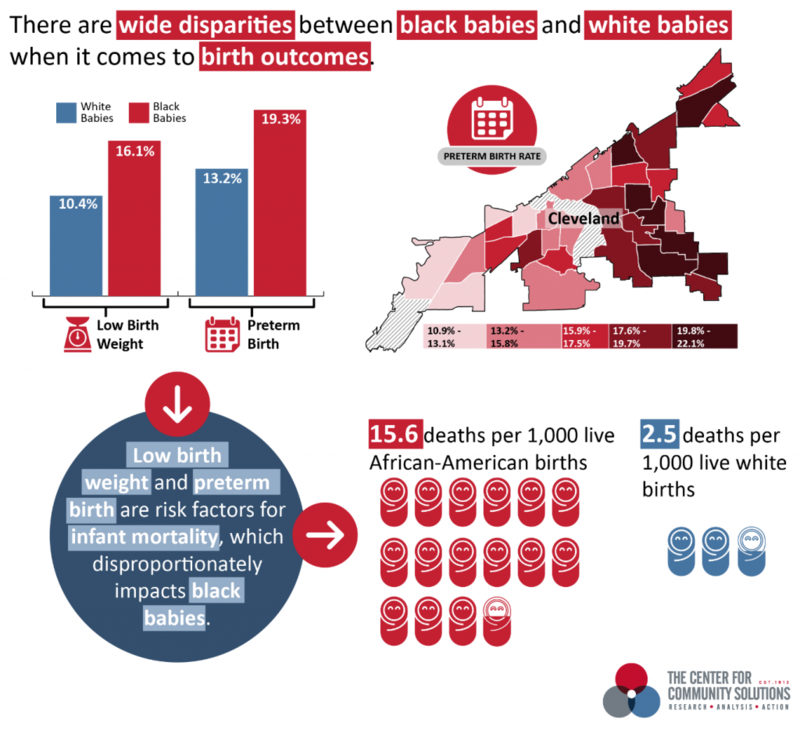 According to Bernadette Kerrigan, First Year Cleveland’s Executive Director, a deep dive into causes of infant death in the county in 2015 revealed that, contrary to public opinion, most black infant deaths were not a result of poverty or non-compliance with medical recommendations. Educated middle- and upper-income black women were more likely to lose their babies than poor white women with less education. Community Solutions has written previously about this here and here. In addition to interventions that target expectant mothers and their environments during pregnancy, it is important to also address issues with providers, health systems, employers and society more broadly in order to save the lives of babies in Cuyahoga County. First Year Cleveland has identified 11 action items, all tackled by multidisciplinary “Action Teams,” as part of its mobilization strategy. Some of these actions include: (1) “research… to better understand the roles race and maternal stress play in infant deaths,” (2) “Increasing the number of expectant moms being served in a CenteringPregnancy Model” and (3) “hire parents and grandparents that have experienced a sleep-related loss to drive the messaging campaign and lead training” to help eliminate sleep-related deaths. Educated middle- and upper-income black women were more likely to lose their babies than poor white women with less education. Two models that have had success in reducing infant deaths and reducing black-white disparities in infant deaths have been B’more for Health Babies in Baltimore and Cradle Cincinnati. Similar to the work that First Year Cleveland is undertaking in Cleveland, both of these organizations use a collective impact framework to target interventions and strategies to reduce infant death and poor birth outcomes. They have both seen success in the last 10 to 15 years. First Year Cleveland is committed to learning from these models and implementing those learnings in Cleveland. One of Community Solutions’ priorities is improving maternal and infant health, and we are committed to researching this issue going forward, and continuing to work toward solutions that will reduce infant death in Ohio. Acknowledgements to Christin Farmer and Bernadette Kerrigan, who generously shared their knowledge with me for this blog.